Randal's path to the Hurricanes began early in life, when his father, Ransom Hill, coached him, and future UM roommates, Alex Johnson and Robert Bailey in little league football. By the time he left Miami's Killian High, he had already earned the nickname "Thrill Hill" and was ready to make his mark in college football. As a true Freshman on the 1987 National Championship team, he set a then school record for kickoff return yardage with 497 yards on 19 returns. He saved some of his finest moments for the big stage. In 1989, Miami faced #1 ranked Notre Dame in a late season contest at the Orange Bowl. 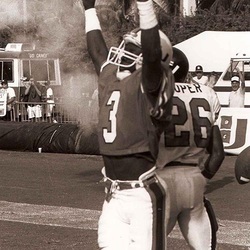 In the second half, with the score tied , and the Canes facing an almost impossible 3rd and 43 from their own 7 yard line, Randal streaked down the right sideline, stretched out, and grabbed quarterback Craig Erickson's pass for a 44 yard gain, in one of the most electric moments in the venerable old stadium. The first down broke the back of the Irish defense and Miami went on to win 27-10, sending the Canes to another National Championship! In the 1991 Cotton Bowl, he was on the receiving end of a 48 yard Erickson touchdown pass that set the stage as the Canes crushed Texas, 46-3. He holds the UM record for career kickoff return yards with 1,169 yards on 54 returns. He ranks in the Top Ten lists for season kickoff return attempts and yards, career receptions (107), career receiving yards (1,643), and career touchdown receptions (11). After graduating Miami in four years with a degree in Sociology, he was a first round draft pick by the Dolphins (23rd overall) and played 7 seasons in the NFL with Miami, Arizona and New Orleans, catching 262 passes for 3,849 yards and 14 touchdowns. When he hung up his cleats for good, he got into law enforcement in South Florida, as a police officer, sheriff's deputy, and currently as a special agent for the U.S. Government. He also works part-time for the NFL. Married to his college sweetheart, Dr. Michelle Hill, the first female in UM's Phi Beta Kappa for Chemistry, they have two children.